This Keter tool chest is a compact yet large enough piece of kit that has the capability of storing both large and smaller types of tools. The integrated organizer on the top has six smaller parts on one side for those smaller bits and bobs, whilst on the opposite side the hand tool compartment with divider is perfect for small hand tools. These two compartments slide backhorizontally on ball bearing to reveal the large compartment below suitable for your larger tools. 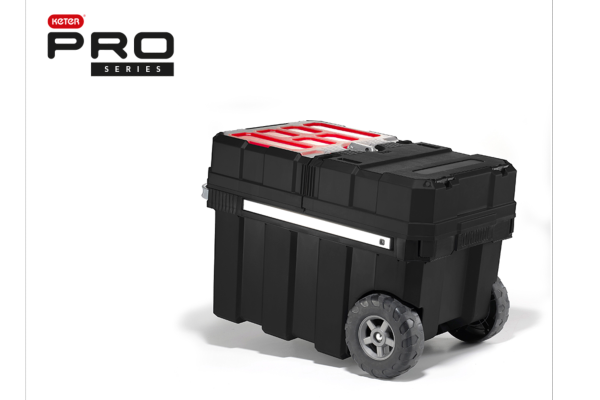 The rubber wheels and soft grip handle means this chest can be easily transported to wherever you need it to go. Central locking system protects the contents of your box at all times.